First Line: Lydia heard the distant flap of paper wings as the first book fell from its shelf. Young Joey Molina is a proud member of the BookFrogs, regulars who spend a lot of their free time at the Bright Ideas Bookstore. When Joey commits suicide in one of the bookstore's upper rooms, the life of his favorite bookseller, Lydia Smith, begins to come unglued. Lydia has spent her life hiding in plain sight. She is bequeathed Joey's meager possessions, and when she begins to go through his books, she finds them to be defaced. The defaced books are disturbing on their own, but they also seem to contain messages to Lydia. What did Joey want Lydia to know? As Lydia tries to find out, memories from her own violent childhood begin to surface. You see, there's a reason why Lydia has been hiding, and it not only takes Joey's death, but the reappearance of her father, a police officer, and a murderer known as The Hammerman to bring the truth to light. Although it's undoubtedly due to the advance reading copy I had, I found the clues Joey left in his books to be very difficult to read-- so difficult that I took the coward's way out and just let Lydia deal with them. But that takes nothing away from the powerful debut novel that Matthew Sullivan has written. Sullivan brings to life a very special bookstore along with its woven-together family of employees and customers. It's a place I could spend hours in, which mean I'd probably join the family, too. Lydia is a strong and uncommon main character. Being the sole survivor of The Hammerman is something that would live with a person forever, and it has certainly changed Lydia in many ways. I was enjoying this book, but not mentally singing its praises until chapter eight. Chapter eight is when "Hammer Night" is described. I do not scare easily, and I'm not squeamish, but that chapter made my blood run cold. Sullivan put me inside the skin of little Lydia so completely that I saw everything she saw and felt everything that she felt. By chapter's end, I was crying for that little girl. This is a masterful piece of writing, and if any of you are worried, it's not graphic. Sullivan does what the best writers do-- let readers' imaginations fill in the details. The mystery is also a good one as one character after another appears to be guilty. The identity of The Hammerman didn't occur to me until a few pages before the reveal, which is always a bonus. 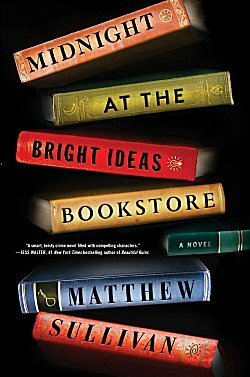 If you're in the mood for a scary, well-written mystery that makes you sit with your back against the wall so no one can sneak up on you, Midnight at the Bright Ideas Bookstore may be just the book for you. This one sounds really interesting, Cathy! I like the setting very much. And an author who can scare the reader without resorting to gore gets Margot-points. Glad you liked this so well. I'll be on the lookout for anything else this author publishes. I like the cover and your write-up of this book. But scared isn't my emotion of choice when I'm reading. By the way, I liked "Missing, Presumed." Am waiting for Susie Steiner's second book to make its way to the library here. So far, I'm liking Missing, Presumed, too.